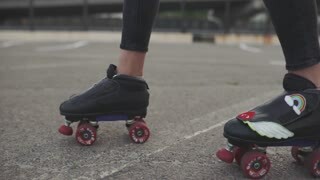 Search Results for "roller blades"
Minsk, Belarus - May 17, 2018 (Ungraded): Woman rides on roller blades around the track on a summer day. Cute athletic boy laces up his roller blades in the garage before playing street hockey in his driveway on a summer evening. Minsk, Belarus - May 17, 2018 (Ungraded): Group of children in protective sports uniform rides on roller blades along sports training track on a summer day. Kiev, Ukraine - APR 8, 2018: Legs of little girl posing on roller-blades on pavement. Kids get new roller blades for Christmas and try them out on the living room floor on Christmas morning in 1963. Minsk, Belarus - May 17, 2018: Older men ride roller blades with sticks around the track on a summer day. Minsk, Belarus - May 17, 2018: Preteen children ride on roller blades along sports training track on a summer day.